Increment Version Increments a semver version number ** Add Tag(s) Adds one or more tags to a build. After you install the extension in your account (see Get extensions for Visual Studio Team Services to learn how to install extensions) you are ready to use the task on your build or release defintions on the account(s) you have installed the extension into. It may take a while until the tasks are available to be used. When you add a new step to your build or release template, you can chose the task from the Utility category, each task has a different set of purposes and parameters. The regular expression replace transformation is much more powerful than the replace transformation, allows you to better control how the replacement is made. This task sets the username/password stored on a generic connection. This task can be used to centrally store a username/password and pass them to tasks that require a username/password without having to have the credentials replicated all over build/release definitions, with this task you can have single copy which can be centrally managed and change it centrally. In your can register service endpoints to store your reusable username/password to use in other tasks. 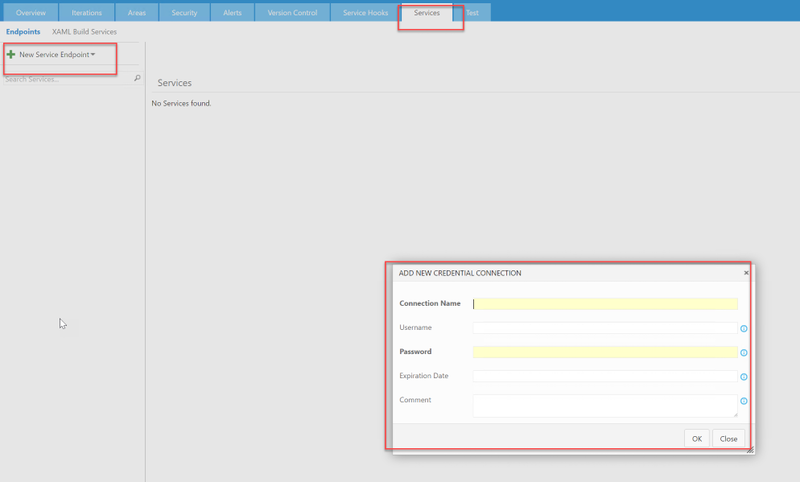 You need to create a Credential endpoint to store the user name and password. Password for this credential, you can use it with other secrets like tokens or such. Expiration Date (optional) You can see an expiration date on the credential. If you set a credential the build will fail if you try to use an expired credential. Ten days before expiration the task will issue warnings about expiration. Note You need to be member of "Endpoint Creators" group to create service endpoints. Extracts a value from JSON (either a file or a variable) using a JSON path expression and sets the value to a variable. If the result is a primitive type (boolean, number,string) that value will be set. If it's an array all values will be set (comma separated), all other types will be set as a JSON string. JSON content The JSON content (if you don't specify a JSON content, you will need to specify a JSON file) where the value will be extracted from. JSON file The file with JSON content and where the value will be extracted from. Extracts a value from XML (either a file or a variable) using a XPath expression and sets the value to a variable. Only node text or attributes are supported. XML content The XML content (if you don't specify a XML content, you will need to specify a XML file) where the value will be extracted from. XML file The file with XML content and where the value will be extracted from. Sets the build number with the passed value. Allows to you set the build number with a different number than the one it was initially assigned on queue. Useful when you want to set the build number using a number with values which build number formatting settings don't support out of the box. Sets the release name with the passed value. Allows to you set the releaze name with a different name than the one it was initially assigned on queue. Increments a build version in the semver format. Allows you to increment by one number the following version components; major, minor or patch. It can also clear the release or the build. Tag(s) The tag(s) you want to add to the build. One tag per line. The tasks send anonymous telemetry so we can get a hold of task usage and errors. No user data or task parameters are ever collected under any circunstances. Only data that allows anonymous usage collection. If you find an issue, need help or have improvement suggestions you can do so by emailing [support@yodlabs.com](mailto:support@yodlabs.com?subject=Variable Tasks Pack) with "Variable Tasks Pack" as a subject. Follow the Yod Labs Extensions twitter account to see release announcements.